Perhaps the biggest tragedy and the best known story in modern Irish history is that of Joseph Plunkett and Grace Gifford’s doomed love affair and hasty prison wedding. The tragic romance sits right next to Romeo and Juliet in the great sagas of impossible love, and their story may be one of the largest reasons that popular opinion swung in favor of the rebels after the 1916 Easter Rising. The day the British executed Joseph Mary Plunkett, they guaranteed that the story of the rebellion would no longer be remembered without the emotional inclusion of Ireland’s favorite tragic widow – Grace Gifford Plunkett. But before there was a widow, there was a headstrong, artistic woman – one who was born on this day in 1888. Grace Gifford was born into a large and wealthy, staunchly Unionist family who lived in Rathmines, a suburb of Dublin. She and her twin brother were two of twelve children and they were the second youngest in the line. In her family, the boys were raised Catholics like their father and the girls were raised in the Protestant faith of their mother in accordance with the Palatine Pact – a set of guidelines created by the church for those in a mixed marriage. Perhaps it should have been the other way around, since more than one of of her daughters would later convert – but the strict mother would not budge on the religious upbringing of her children. It has been said that Grace was stubborn and not always easy to get along with. She was a gifted artist and with that came a temperament that some found to be obstinate and flighty. She was generous but somewhat entitled. She was raised to be a proper lady but was willful and overtly flirtatious at times. She and her sisters took every opportunity to get out of their house and wander through the streets of Dublin, which was unusual for young women of their standing. In the city they saw how differently most people lived than they did and it struck each of them in different ways. Nellie joined the Irish Volunteers and various women’s militant groups. “John” (Sydney) became a prolific journalist, writing commentary on life and politics in Dublin. Grace converted to Catholicism and she and her sister Muriel both married Irish revolutionaries, despite their parent’s objections and the differences in their backgrounds. Though Grace was not overly political herself, she did believe in equal rights for women and was a supporter of Sinn Fein. Many of her first illustrations were published in Nationalist newspapers and literary magazines, including the one that her brother-in-law, Thomas MacDonagh, had started called the Irish Review. While she was trying to sell her illustrations in Dublin she would frequently head over to the Pro-Cathedral in order to hear the choir sing. She was struck by the voices and the congregation equally, because it was vastly different than the suburban Protestant church she grew up in. She turned to her Catholic friends and acquaintances for answers to her questions about their religion – and one of those people was Joseph Mary Plunkett. Although they had met before, Grace and Joseph were not instantly connected. It was many months before they even had a friendship, and a little longer before it deepened into a love affair, but once it began, there was no stopping it. Grace’s parents were not happy with her choice – and they made that very clear. It has been revealed in the years since that many in the Plunkett family disapproved of Grace as well. It didn’t matter to the couple though – and they wrote long and passionate letters and fervent love poems to each other, dreaming of a time when they could finally be married. To this end, Grace learned a little more about the faith, and the political aspirations and plans of her future husband. She sympathized with the Nationalist cause, but she was not actively involved. That was enough for Joseph, who was blinded by his love for her and distracted by his own frantic planning. Their wedding was to be on April 23rd, 1916 – Easter Sunday. This has always struck me as a little odd. After all, that was the original date for the Rising, and Plunkett was one of the leaders and planners of the rebellion. He would have known that there wouldn’t be time to have a wedding in the middle of the battle – but he planned for one anyway. As a member of the secretive Irish Republican Brotherhood, he was certainly hiding things from his wife, but I always thought it odd that he didn’t encourage her to pick another date. In the end, it appears that he was hiding quite a lot from her – including just how bad his health had gotten, and the details of the looming conflict that was about to drastically change their lives. Joseph Plunkett had gone into hospital shortly before the Rising for yet another surgery. He checked himself out and spent the night before it was scheduled to begin in the Metropole Hotel. Grace met him there and it was to be one of their last meetings. The following day when the rebellion was postponed he remade his will, leaving everything to her. He sent Michael Collins to deliver a package to Grace, which contained a small gun and some money. Later she stated that she didn’t know which of the two scared her more – the weapon or the funds. The next morning, the Rising began. The Gifford sisters spent the next days huddled in Muriel’s house, hoping for news of their men, who were both in the fight. Toward the beginning of the battle, Muriel was able to go to the General Post Office—the headquarters of the Rising—and see Joseph Plunkett. He told her to relay to Grace that he wanted to marry her even if he was going to jail. By this time, they all knew that was a certainty because there was no way the rebels could win. The sisters hoped and prayed for their safety and tried to believe that their lovers would be treated as prisoners of war when the rebellion was over, but they were not stupid. They both knew there was a very real possibility that their men would never come home again. When the men and women of the Rising finally surrendered days later, most were sent to prison. Nellie Gifford was interned at Kilmainham Gaol, where the leaders of the rebellion were also being kept while they were awaiting execution. 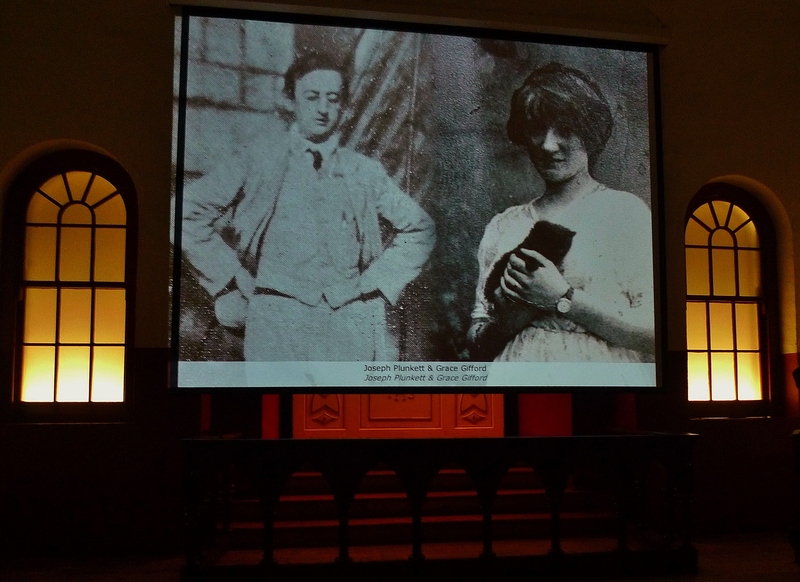 It was during this time that the letters between Joseph Plunkett and Grace Gifford became heartbreaking and desperate. Both wanted to marry regardless of his upcoming demise but they knew it would be highly unusual for the authorities to allow such a thing and they were running out of time. Somehow, the warden was convinced to allow the marriage. There have been many debates over why it was given approval – and a very convenient and popular one is that Grace was pregnant. Given the strict rules about unwed mothers and their children, she may have appealed to the warden to save her and their child from contempt and illegitimacy. Something certainly changed the warden’s mind and he made what was to be a terrible error by allowing them to marry. On May 3rd, 1916, at 8:00 in the evening, Grace was led into the prison chapel at Kilmainham for her wedding. Her eyes were red and her face showed hints of misery and exhaustion. She had purchased her own ring in the city before her arrival, and though her sister was a prisoner there, she was not allowed to attend. Grace stood alone at the altar waiting for her doomed future husband to join her, surrounded by the armed guards who would be the only witnesses to their wedding. When it was finished, they had ten minutes together, under the prying eyes and jeering voices of the guards – and in the morning, just a few hours later, Joseph Mary Plunkett was shot. Almost immediately following his death, Grace was moved into one of the Plunkett homes and it was during this time that his sister Geraldine later claimed that Grace had a miscarriage. Soon after, relations seemed to sour in the family. They refused to accept Joseph’s revised will and would not give any of their fortune to his widow. Grace, meanwhile, was recognized all over the country as a potent symbol of martyrdom and the story of her jailhouse wedding spread like wildfire all across the world. It was a catalyst for the population, who up until that point were annoyed with those involved in the Rising. As the story spread, they began to be angry at the British for the way they handled the secret trials and the executions of the leaders and for the destruction that they rained down on Dublin. Grace and the symbol she became, added to that anger in a significant way. It was not the ideal claim to fame–she would rather have been known for her art I’m sure–but suddenly, she was a force to be reckoned with. Whether she ever intended to be political or not, the death of her husband made her so. She remained a staunch supporter of equal rights, and her caricatures and cartoons became ever more political in nature. Although she sometimes struggled to make her living as an artist, she never sold any of the love letters or mementos left over from the Rising and her brief marriage and refused to give them up until there was a museum to preserve them. She was steadfastly against the Anglo-Irish treaty, and when she publicly declared that position, she did so in memory of her husband. Grace never remarried and eventually she took her maiden name out of the equation, becoming simply, Grace Plunkett, or Mrs. Joseph Plunkett for the rest of her days. She was later imprisoned in the same jail that her husband’s execution took place in and happened to be interned on Easter Monday in 1923. She carried a tricolor flag and a wreath to the yard where he was shot and spoke both about her husband and the Ireland that he had fought for. 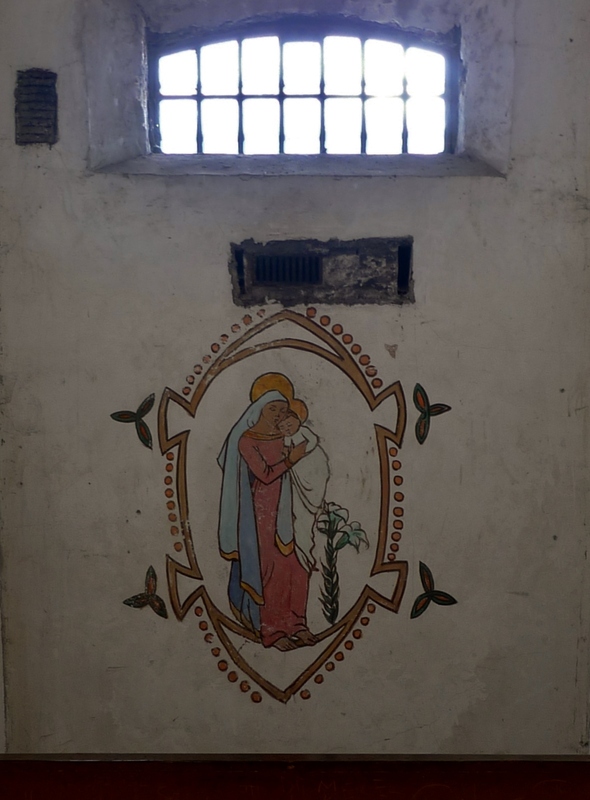 To pass the time while she was a prisoner, Grace painted a lovely mural of Mary on the wall of her cell. It remains there to this day, known as the Kilmainham Madonna. In her later years, Grace developed health problems. She also became harder to deal with, she demanded a lot of her friends and began quarreling with even her biggest allies. She was cantankerous and angry at anything she felt was a slight or a sign of abandonment. She died on December 13th, in 1955, alone in her apartment – a fact that many found heartbreaking. Her funeral was attended by the Plunkett family as well as her own. It also included a veritable who’s who in Irish politics at the time. Any recent quarrels were forgotten and she was mourned by everyone from friends and family to Eamon De Valera himself – the President of Ireland, who once fought beside her husband. In her later memoirs that were published long after Grace had passed away, Geraldine Plunkett—her sister-in-law—claims that she and Grace always got along, but she also insinuates that Grace was opportunistic and was motivated to marry Joseph Mary Plunkett by status and greed. She even hints that her brother was not responsible for Grace’s alleged pregnancy, which is quite the slanderous remark for that day and age. Regardless of these rumors, Grace Gifford and Joseph Plunkett’s love affair and wedding will forever be remembered as one of the greatest tragedies and biggest turning points in Irish history. 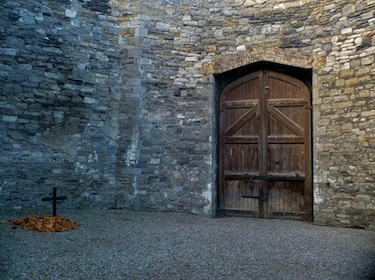 Some of their letters and mementos can still be seen in the museum located at Kilmainham Gaol – and the tour begins in the chapel where they were married, keeping their story fresh in the minds of all who visit. This entry was posted in activism, Inspiration, Ireland, Irish History, Love, writing and tagged Easter Rising, execution, female prisoners, Grace Gifford, Grace Gifford Plunkett, Irish Prisoners, Irish Rebels, Joseph Mary Plunkett, Joseph Plunkett, rebel leaders.